I raised him to believe that men stand up for what’s right and, in particular, to protect women and children. Yet here were two young people setting themselves on fire. How could I ever ask of him to stand up when I was not prepared to do it myself? It was deeply confronting, so what motivated me was shame really, shamed by a 12-year-old. (Quote is from an article written by Chris Mordd Richards for IA on the 17th Feb 2018 – you can read the whole thing here). specifically those on Manus Island and Nauru. Instead of sitting back and shrugging his shoulders and trying to leave it to others, Adam felt it necessary to show his son that it was not OK.
to accept the situation. Adam felt it necessary to show Ned, that there was always something that could be done. Even if that something was a protest or just trying to keep the situation in people’s attention, so that public opinion would change and the politicians would do something. So, with a quick bit of organising, a small support team, made up of friends and family, organised themselves to help Adam. 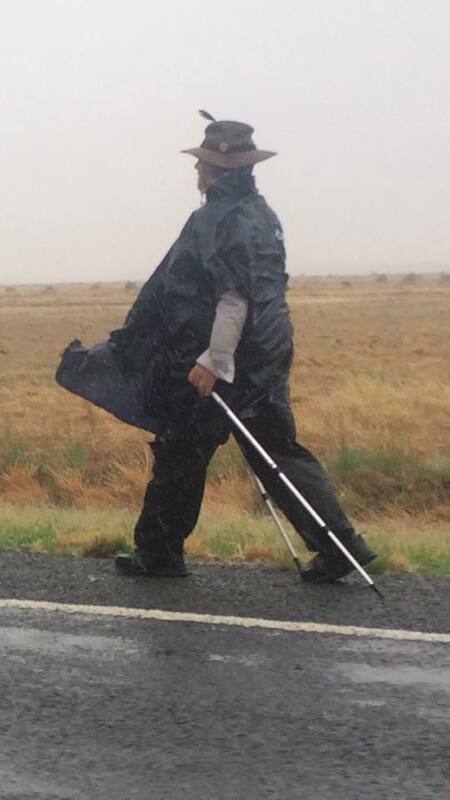 Adam decided that if he walked to Canberra people were sure to take notice and Ned wanted to walk with him. That was last year. Ned and Adam walked 1194km and six weeks later arrived in Canberra. They were joined by friends, family and a few others, who agree with Adam’s stance, for the last leg of the walk, which was ending at Parliament House. Sunday the 10th March, 2018, they will again walk the last leg (of their current walk) up to the steps of Parliament House. And again, they will be joined by others who agree with Adam and Ned that something must be done! So what is the situation that Adam, Ned and many others are protesting, that they want all Australians to get behind? It’s something that you have all heard about. 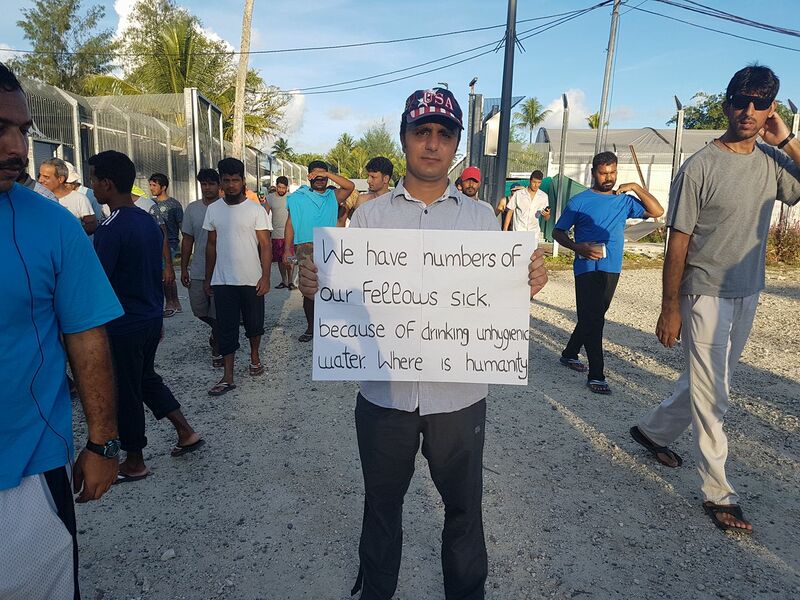 It’s the situation on Nauru and Manus Island that the Australian Government has caused with their detention of refugees and asylum seekers. The Manus Island and Nauru centres were established in 2001 and the Manus Island processing centre was closed last year on October 31st. What was initially intended as a short-term thing has been going on for over 15 years. While the idea might have been a great one to start with, it has turned into a nightmare of a situation. The conditions that the people who have been detained there are so bad that the UNHCR (United Nations Human Rights Council) have warned of a “humanitarian emergency.” The UNHCR became involved after human rights abuses were documented. The centres are overcrowded and insufficient medical and psychiatric care has been provided. There are documented cases of physical and sexual abuse by the centre’s security. It’s no wonder that the people detained are self-harming and committing suicide. None of these options are acceptable and not surprisingly, the refugees are looking for a fourth option. In the instance of the first option, to return to their home would be to return to that which they were trying to get away from in the first place… persecution. centre to another would not be desirable and moving into the city, where some of the locals don’t want them, isn’t either. Some locals have already shown violence towards the refugees, in 2014 they attacked the Manus centre which resulted in one refugee’s death and 77 injured. The same group of locals have warned the detainees that they will attack if they come to Lorengau. From what I’ve read, a lot of the locals of PNG feel the same towards them so trying to find permanent settlement (option three) on PNG isn’t really an option either. (Not all the locals feel that way as some do support the refugees). The only option they want, is what they tried to come here for in the first place, to come to Australia. But after the way we’ve treated them, a lot don’t want that anymore anyway. On Manus, “closing the camps” means forcibly removing people who are on a small island to an unfenced “camp”, where they are vulnerable to attacks by locals who don’t want them there. 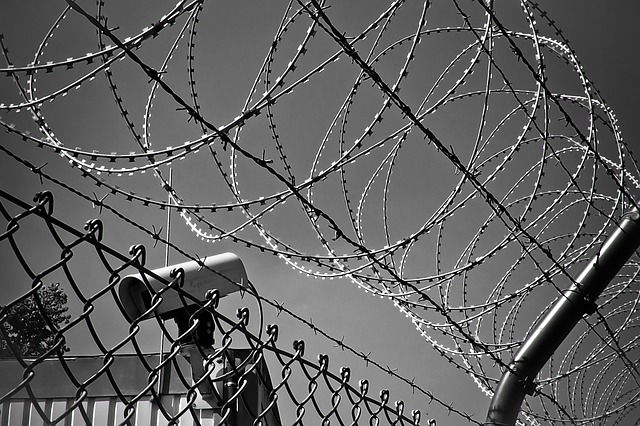 Only last Easter, bullets were fired into their fenced detention centre. Now they are more vulnerable than ever. On Nauru, “closing the camps” means opening the gates to allow “freedom” for hundreds of men, women and children on an island the size of Tullamarine Airport, where again the locals don’t want them. That isn’t ending offshore detention any more than Pontius Pilate ended the persecution of Jesus by washing his hands. People shouldn’t be used for politics and our nation’s humanity ought not be sold for votes. I believe Aussies don’t abuse strangers and should never mistreat children. That’s my Australia. That’s my family’s Australia and the Australia of everyone I know. Because I love my country, that’s why I’m walking. (Quote is from the same article written mentioned earlier – you can read the whole thing here). At the start of their walk, Adam and those gathered, sang the Australian National Anthem outside the Opera House and were evicted. It seems that holding a sign that says “Walk for Freedom of Refugees” and singing our National Anthem is not allowed. Adam points out that the second verse of the Anthem contains the words, “For those who’ve come across the seas, We’ve boundless plains to share” yet it is something that we either choose to ignore or forget. I’m sad to say also that while they were walking, there were two more attempted suicides on Manus. I think Adam’s outside the box thinking has shown that even when you think you can’t do something, you really can. Will Adam’s walk get the people their freedom back? No, sadly it won’t. But it is raising awareness which is putting pressure on the politicians to do something. So the situation is not as hopeless as it seems. If you agree that something must be done and want to support Adam and Ned, there are several ways that you can get involved. 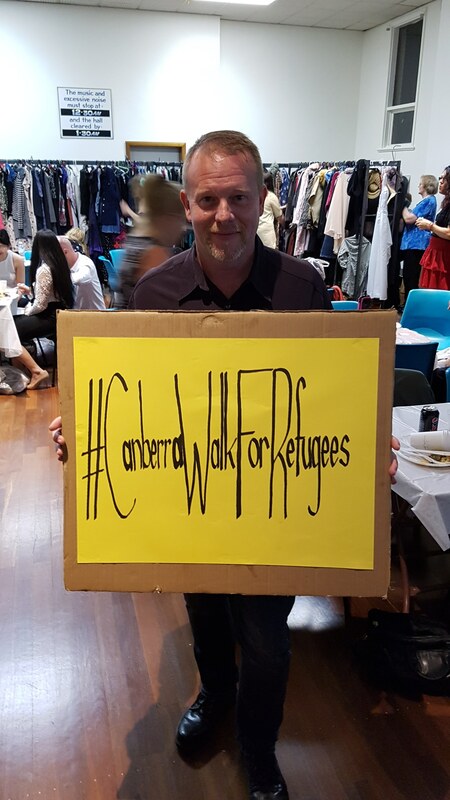 They have a Facebook page, Canberra Walk for Refugees which has a list of things you can do. On Sunday 11 March, we will rendezvous at 10 AM for the final stage… …We will march to Parliament House and have a rally on the front lawns. We will also walk down to Lake Burley Griffin and launch the boats… …People are encouraged to join in the Regatta part of the event and bring along a homemade boat and march with it. Let’s see them stop these boats! #CanberraWalkForRefugees and take a photo or video of it and post or share it to the Facebook page for the campaign here or wherever you can post photos ie Twitter, Instagram etc. Why not tag 5 friends and ask them to do the same thing? add up all the km’s and see if they can symbolically cover the distance from Canberra to Nauru and Manus. Lastly, there is a fundraiser. 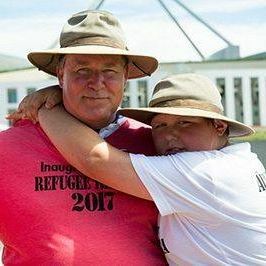 Initially it was to cover the costs for Adam and Ned’s walk but seeing as those expenses have already been covered from other fundraisers, all the excess funds are going to charities that support the people on Manus and Nauru. It is on Go Fund Me and can be found here. Seriously Australia, the conditions that our Government has created for these people to live in, is just plain terrible. It is condemned by the UNHCR and a violation of the conventions that we signed! If we all get behind this or something like this, the Prime Minister has to listen and has to do something! What do you think? Leave me a comment below or click the like button if you agree. Photos are either my own, courtesy of the Canberra Walk For Refugees Facebook page or copyright free.